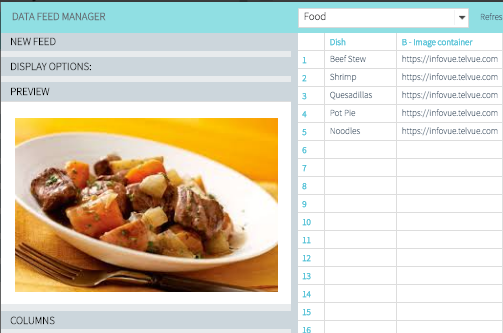 A “Server Feed” displays information that you enter into a spreadsheet within the InfoVue Data Feed Manager. This is useful for displaying lists – like a schedule of events, a roster of team players, a conference schedule, or a lunch menu. You can include images in this rotating display. You can also give an outsider access to only the spreadsheets, so that they can update the information remotely, without ever touching the rest of your InfoVue content management. Click on grey New Feed toolbar. Select “Server Feed” from “Type” pulldown. Define each column as Text or Image. Name the column for easier identification when designing. Click on empty cell to type in info (for text columns) or upload an image (for image columns). Note: The Server Feed image library is distinct from the other media libraries in InfoVue and available only through a Server Feed. They can be previewed from the grey Preview toolbar on the left. Note: Unlike slideshow images, Server Feed images do NOT distort to fit the container. Rather they scale to preserve the original aspect ratio. But if you upload a tall image in a horizontal container, it will shrink to match the height. When displaying Data feeds, InfoVue uses a “referent” column to control the reading speed (how long a feed field stays on screen before moving on to the next item). Click on the grey “Display Options” toolbar to designate the “referent” column, which should be the column which will normally contain the most text. In a weather feed, the referent column should be the “enclosure”. InfoVue will base the duration of each entry on how long it takes to read the referent column. Click OK button, top right, to get back to the Template Designer. In the Template Designer, under the grey Data Feed Manager toolbar, choose the feed you want from the pulldown. The available fields will show up below. Each field is a column title from your Server feed. Decide on font color, style, size etc. Size and position each field, making sure your zone is large enough to accommodate the entry with the most text. Feed effects and Reading Speed – The grey Data Feed toolbar on the left gives you a few more editing options on your feeds. Feed effect pulldown: add an effect to each line of a feed that set the transition effect between items. Reading speed. Remember the referent field? Here’s where you can slow down or speed up your feed. 100 is the default. 200 is twice as fast. 50 is half as slow. In the template designer, click on the referent field of your feed to adjust the reading speed.